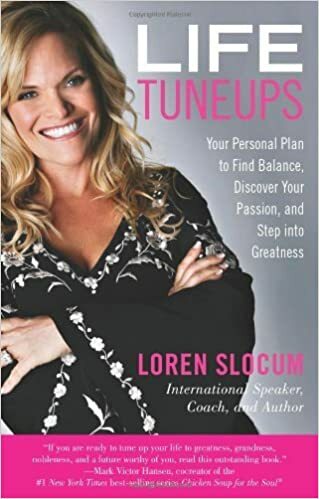 In her new book, Life Tuneups: Your Personal Plan to find Balance, Discover Your Passion, and Step into Greatness, accomplished inspirational speaker and author Loren Slocum is committed to helping women change their lives for the better long-term, not for a “quick fix”. The book is the first step in a movement to help you make yourself a priority once again, and make true lasting change- not through drastic and painful sacrifice, but through small permanent life adjustments. To celebrate the book, as well as the strong communities of women found around the globe, the Life Tuneups Launch Tour will host celebrations around the United States and across the world. The launch celebrations I will also feature the introduction of the Lobella Groups, where women just like you will get together in local areas once a month, for fun, for conversation, for time to connect with girlfriends and focus on the areas that matter to you most- your family, your health, your finances. Once a month you’ll learn tips and resources to help you tune up your life, and make the small shifts that can make a bigger difference. What will happen each month? Once a month, the groups will gather for about two hours- the first part of the meetings will be a social hour- with light refreshments, maybe drinks, and time to catch up with the women in your community. In the second half of the night you’ll get your monthly tune up. Each monthly meeting is driven by a theme; from health to beauty, relationship to money, we will focus on the areas that mean the most to you in your life right now. Your city facilitator, along with a chosen expert, will go through the tune up for the meeting. These meetings are meant to be educational and fun, a release from every day, and most of all, a time for you to recharge. What will I do as a Lobella Facilitator? As a facilitator you will run the meetings. During the social hour you are the connector- constantly checking in with the girls, nurturing them, making sure everyone is having a great time. During the second hour you will be presenting along with the expert for that day. You wil talk about content we’ve given you in advance, as well as help the expert present to the room. How will I get the content? We will post the content online as well as set up regular calls. We’re having a new conversation. And giving women permission to be the woman they want to be. Lobella: Changing the world one woman at a time. We all have dreams. Some dreams are small and others large. When we reach one dream there is always another waiting in the wings to take its’ place. The thing about dreams is that we are usually a bit nervous to tell oth . . .